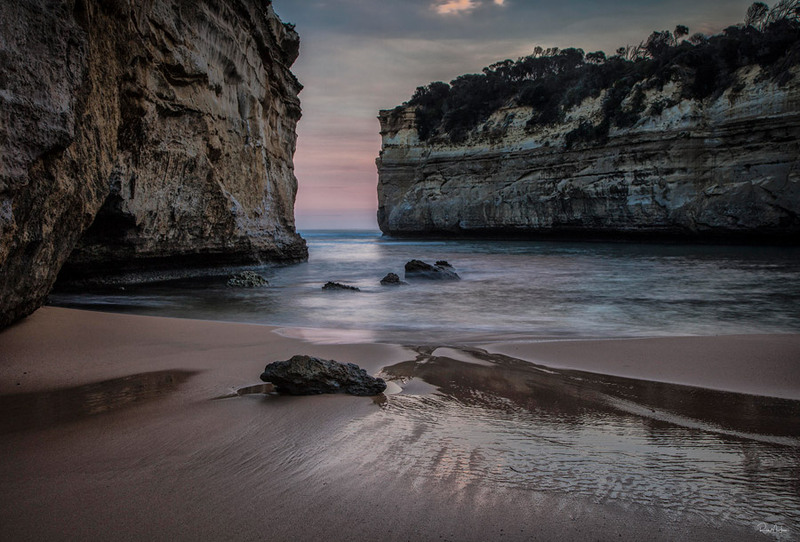 The shipwreck coast of Victoria holds many attractions for landscape photographers. Along the coastline the erosive power of the sea has first created massive limestone structures, then relentlessly pounded them until ultimate collapse. But amidst the ‘wild’ there can also be ‘calm’ – safe havens which shelter & protect. History tells us that during a storm in 1878 a ship from England struck an offshore reef & quickly sank. Of the 54 people on board only 2 survived by reaching the shore at this spot. I was mindful of that history during the shoot. Although very calm & benign on the day, it was not difficult to imagine high winds, stormy seas & two people desperate to find shelter.